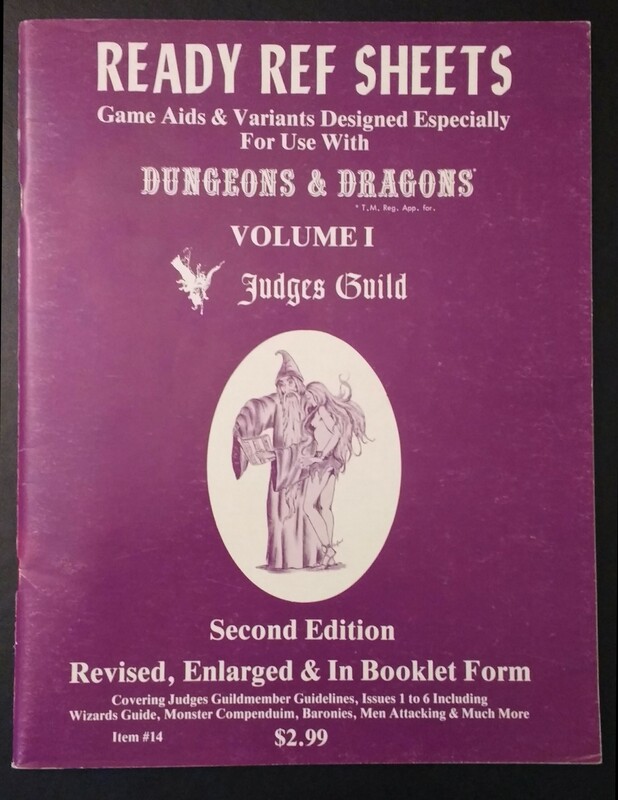 I’ve been considering using the Judge’s Guild Ready Ref Sheets to streamline initiative in my White Box games. If you haven’t seen the Ready Ref Sheets, they were released in 1978 as a referee’s aid for OD&D. They have some really great random tables and include the usual monster listings and attack tables. I bought two physical copies a few years ago at the original cover price. The way I would use it as a player would be to pre-calculate my priority number by weapon. That probably won’t change much, unless the character’s dexterity changes, or they lose their armor to a rust monster, say. For spellcasters, I would write down my priority number by spell level, or note what it is when reading a scroll. As a referee, I would make the priority number part of a monster’s stat block. That would speed up combat a bit, by removing the need for an initiative roll. But what I really think is neat about this is that it would allow players to make tactical decisions around weapon choice. If I were playing a fighter, I would make a point to carry a longer weapon like a spear, and a missile weapon, in addition to a sword. As a M-U I would favor memorized spells over reading a scroll, given a choice. The note at the bottom “In case of a tie compare actual dexterity ratings” is interesting. That seems to imply that monsters have a dexterity, which implies this table was created with Holmes Basic in mind. The copyright date supports that, although the combat tables reference the Greyhawk OD&D supplement, not Holmes. Both would have been in print at the time the Ready Ref Sheets were published (note in comments – according to Zach Howard/Zenopus, this table first appeared in 1976, in JG’s Thunderhold, so it pre-dated Holmes Basic). Has anyone used this system in their games? I’d be interested to hear how it plays. It appears that the table first appeared in “Thunderhold”, which predates Holmes: http://www.acaeum.com/jg/Item0014.html (thanks to Zach Howard for that piece of information). Thanks for the info, so this table first appeared in 1976. Makes sense, I know some of the other tables in the Ready Ref Sheets come from other JG products – or maybe they all do, I only have a handful of original JG products myself. I had used it and its a real fast and elegant system. The problem is that its also rather flawed. Chainmail uses a weapon speed system and a weapon length system. In the first contact a weapons length determines who goes first, this is the advantage of a long weapon like a spear versus swords or a monsters natural weapons like jaws or claws. First strike strategies were big for character survival. Once combat is engaged the long weapons like a pike were to bulky to use so would be dropped in favor of swords. JG kept the basic idea in place but did not take in effect the advantage of a faster weapon in later rounds. To fix it just flip the weapon speeds above and leave the rest in place. The JG rules also removed the extra attacks you would get with the faster attack weapon, The lighter weapon could get 2-3 extra attacks or even attack parry sequences. Even the charge attack gave a bonus of an extra attack. Thanks for the comment, that makes a lot of sense to flip it in the first round to give longer weapons the advantage. Although it doesn’t work so well for low-level spells or glance attacks, which should always be fast. But for pure melee that is a simple enough fix. Perhaps this chart’s failing is trying to be all-encompassing. The below is used if the character starts his round within 10′ of an enemy. 8 Short, 6 Medium, 5 Long, 4 Very Long and 3 Extreme. If a character is within 10 of multiple enemies and no move can be made then the table is always flipped. EX. Bonk the Dwarf is armed with a Spear (Long weapon) against 3 goblins armed with maces (Short weapons). As Bonk is not engaged he moves to attack one of the goblins, he goes first based on weapon size and kills the goblin. The two remaining goblins now move to engage Bonk and he survives the attacks. Now we flip the weapons and the goblins now go first in there attack, Bonk must wait and if he survives may then attack. The rest of the table is not changed. What is important about the above is that the sequence is also movement based so a user with a longer weapon get to also move first, giving the character a chance to engage in melee before his opponent can move away. This is a plus against spell casters who cant cast in melee and missile weapons as well. For monsters its best to use one of the weapon sizes from above, so a wolf might be considered a medium weapon. Use the above the same way including the flip as monsters tend to charge in to battle so longer weapons can get that first attack in. Also remember that combat is entered when the combatants are within 10′ and not base to base. The surprise table shows that an encounter can start within 10′ so sides might begin engaged. Interesting. I’m starting up an OD&D campaign using only the LBBs, and have been looking at this chart as well. I’m going to trying it with Ken’s 1st round weapon flip.